Lying on Guebwiller’s splendid slopes, this 140 hectare vineyard stretches over more than 5 kilometres on the southern side of the Vosges. At an altitude of 250 to 380 metres it benefits from a splendid climate which has led this valley to be called the "Valley of Flowers". The slopes, often as steep as 1 in 2, have light sandy soil due to the slow erosion of the underlying pink sandstone. This vineyard faces south-east, south and south-west meaning that it is ideally exposed to the sun. The vines themselves stretch for 850 kilometres (570 miles) in horizontally planted rows along 5 terraces which are protected by dry-stone walls. 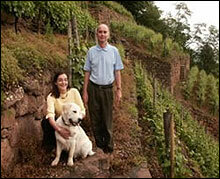 The Schlumberger family come from the Swabien region in South Germany which today is part of Bade Wurtemberg. Claus Schlumberger was the first member of the family to settle in Guebwiller in the 16th century, at the time of the Abbots of Murbach. He very quickly opposed the hegemony of the said Abbots and left to settle in Mulhouse, which had been a free town since the XIVth century and which had also been won over to Protestantism. When Claus died, many of the Schlumbergers from Souabe came and settled in Mulhouse to work as tanners like Claus. Then a number of generations of the Schlumberger family followed and in the XVIIth century they were the largest family in Mulhouse. Peter Schlumberger (1750-1830), father of Nicolas, invested his money in Jean-Henri Dollfus’ company which was the largest manufacturer of printed calico at that time. His son, Nicolas Schlumberger, born in 1782, 12th generation of the Schlumberger family, came back to Guebwiller in 1810, and created a textile factory which very quickly became a great success. Like many of the manufacturing bourgeoisie he was keen to settle, so he also bought 20 hectares of vines which were the start of Domaines SCHLUMBERGER’s vineyard holdings. He married Marie Elisabeth Bourcart, otherwise known as Lise, who bore him 9 children. Nicolas died in 1867 and left his prosperous business to the 3 sons of his who were the most motivated : Nicolas (junior), Jean and Adolphe. The two brothers, Nicolas (junior) and Henri, quickly came out of the business after the death of their father. Jean settled the inheritance: some hectares of vines, fields and forests. Jean married Clarisse Dollfus in 1845. They had 6 sons. Ernest, one of the sons, married Caroline Trautmann in 1882. They had 7 children of whom 2 died young. 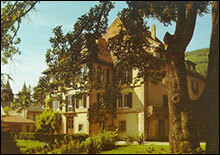 He had a passion for forestry and settled in the château of Bonnefontaine, which was a present from his father, Jean. Paul, Jean’s other son, married Marguerite de Witt with whom he had 6 children. To avoid them taking German nationality, at the time of the annexation of Alsace by the Prussians, Paul left the family business and settled in Paris. His sons : Conrad, Marcel and Daniel looked into drilling and left for the U.S.A. where they founded the Schlumberger petroleum company (electricity meters, telephone boxes, parking meters etc…). Maurice, one of Paul’s other sons, created the bank Neuflize, Schlumberger and Mallet (N.S.M). In Guebwiller, Ernest senior sent his son to Guebwiller to look after the textile business and vineyard. Ernest junior (1885-1954) married Christine Schlumberger (1894-1971), his first cousin, with whom he had two daughters: Anne (1914) and Clarisse (1919). We have borrowed the names of these three exceptional women and named our most prestigious cuvées after them. Ernest (junior) had a passion for the vineyard and devoted all his life to it. Careful to protect the reputation and prestige of this family, whose origins go back to 1410, he was the only one to take on the considerable task of replanting the vineyard after it was attacked by phylloxera. He thus managed to enlarge the vineyard from 40 hectares to 110 hectares and introduced the system of horizontal planting. Anne married Roger Koch and bore him 4 children, Clarisse married Jean Beydon and bore him 3 sons. I would like to finish by reciting for you a passage from Clarisse’s book (Schlumberger: racines et paysages by Clarisse Schlumberger, published by Oberlin), which perfectly reflects the state of mind when managing these family businesses. If some of the Schlumbergers seem to have personified the idea that one can have of success, they had too much of a sense of proportion to pride themselves on their success or to believe that they had succeeded in life. They probably were not motivated by money or power, because above all they had a passion. […] Yet, conscious of their responsabilities towards those who they carried along in their wake and just as demanding of others as themselves, their success was ever only a team effort to which everyone brought the best of themselves. The 50 best-located vineyards in Alsace have been designated "ALSACE GRAND CRU". There are four of them at Guebwiller: Kitterlé, Kessler, Saering and Spiegel. Each of them has specific geology, exposure and micro-climate. All of these factors combine to produce the most renowned wines from Guebwiller and Alsace since vines have been grown by man. Only four grape varieties are permitted when making an Alsace Grand Cru, they are the noble varieties: Riesling, Pinot Gris, Gewurztraminer and Muscat. The production of Grand Crus only represents 4% of the total production of Alsace wine. With 70 hectares of Grand Crus, (that is half of its holdings), Domaine Schlumberger is the leading producer of Classified Grand Crus and is proud to lift the quality of its exceptional terroirs even higher quality of its exceptional terroirs even higher, notably by initiating a local charter of production.